A soaring hawk can be majestic to see over the yard, but some of the glamour is lost when birders realize hawks eat birds and may be hunting favorite backyard species. 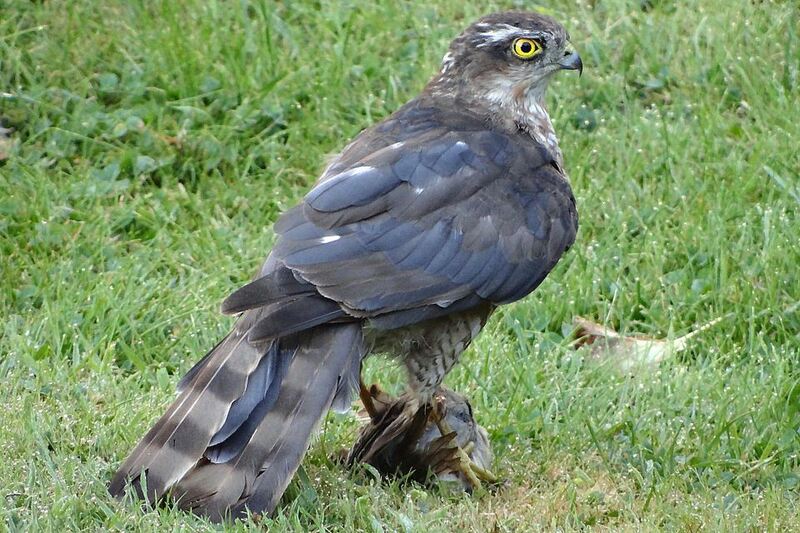 Many birders prefer to protect their backyard birds from hawks rather than contribute to a predator’s meals. While it may not be possible to completely prevent hawks from visiting a yard, there are many easy ways to give backyard birds an edge over aerial predators without harming any birds. The most common backyard hawks are all smaller birds of prey: the sharp-shinned hawk, the Cooper’s hawk and the American kestrel in North America, as well as similar species in other parts of the world. While it is possible that larger hawks will visit backyards to hunt, these species are fast, agile fliers that are well adapted to flying around feeders, buildings and trees to catch small, panicked birds. It is important to remember that even though it may be disheartening to see a songbird fall victim to a hawk, the hawks are only playing their role in nature’s cycle. They do not kill more birds than needed to survive, and in fact, studies estimate that only 10 percent of a hawk’s kills are successful. Of those successful hunts, the majority of the birds a hawk takes are old, weak or sick and removing them from the flock will help strengthen the remaining birds. Because of this, some backyard birders actually encourage backyard hawks and take steps to deliberately attract them. Backyard birders who prefer to offer the most possible protection for their resident flocks have several options to foil a hawk’s hunt without causing harm or stress to the raptor. Shelter: Providing natural cover for small birds is the best way to protect them from hawk attacks. Dense trees, shrubbery and brush piles are all suitable. Shelter should be within 10 feet of bird feeders so small birds can reach it quickly when they feel threatened. To make landscaping do double duty, choose plants that provide seeds or fruits for the birds and they will be able to feed in the cover and in complete safety. Shield Feeders: Place bird feeders in covered areas such as under an awning, gazebo, umbrella or lower tree branches where the canopy will prevent hawks from seeing available prey. Alternatively, covered platform feeders can provide some visual shielding from circling hawks. Avoid Ground Feeding: Birds that feed on the ground, such as doves, quail and sparrows, are more vulnerable to hawk attacks. They cannot react as quickly to a predator and their options are limited as to where to go. Avoid low feeders or feeding birds on the ground to minimize a hawk’s success. Remove Hawk Vantage Points: Hawks will often stake out suitable hunting grounds and wait for unwary prey to approach. To make your backyard less inviting, remove dead branches that a hawk may perch on, or choose fencing they will not be comfortable with, such as thin wires that can be difficult for larger birds to grasp. Remove Hawk Food Sources: There are many things birds of prey eat in addition to small birds. Removing additional food sources such as field rodents or large insects will make the hunting ground less attractive, but only use extermination methods that will not harm birds - poisons and glue traps should never be used. At the same time, store birdseed properly so you are not inadvertently feeding rodents. Cage Feeders: Choose bird feeder designs that include wire cages that protect perches and feeding ports, or build a cage around existing feeders. This will allow small birds to access the food in relative security since larger birds, including hawks, will not be able to reach them. While this will not prevent small birds from panicking at a hawk’s approach, it will help give them a moment or two to flee while slowing down the hawk. Protect Windows: Use decals and other methods to prevent window collisions by panicked birds. When a hawk attacks, small birds will mistakenly fly into windows and a stunned bird is easy prey. Remove Feeders: If hawks are still a menace to your backyard birds, remove all bird feeders and cease feeding the birds for a week or two. After a few days, the hawk will move on to different hunting grounds but the smaller birds will quickly return when you resume feeding. The hawk may return as well, but generally it will take longer for a hawk to rediscover a good hunting area. It can be frustrating to contend with aggressive birds of prey, but there are certain tactics that should always be avoided when discouraging hawks. Under no circumstances should birders ever try to shoot, trap, poison or otherwise harm birds of prey, which are protected by many federal and state laws. Similarly, do not release cats or dogs in an attempt to scare a hawk away. Cats and dogs will not usually attack birds as large as hawks, and the pets themselves may become victims to larger birds of prey. Furthermore, cats and dogs are just as likely to kill, stress or disturb the backyard birds you hope to protect. If a particularly aggressive hawk refuses to leave your yard and becomes a threat to pets or humans, contact local wildlife management or animal control officials. It is possible that the bird is injured and unable to hunt in more difficult areas, or it may be nesting nearby. Either way, only licensed officials should make that determination and they will be able to either remove the bird without harming it or can offer additional advice on protecting backyard birds from hawks. Pest Control Techniques Can Kill Birds - Keep Them Safe!